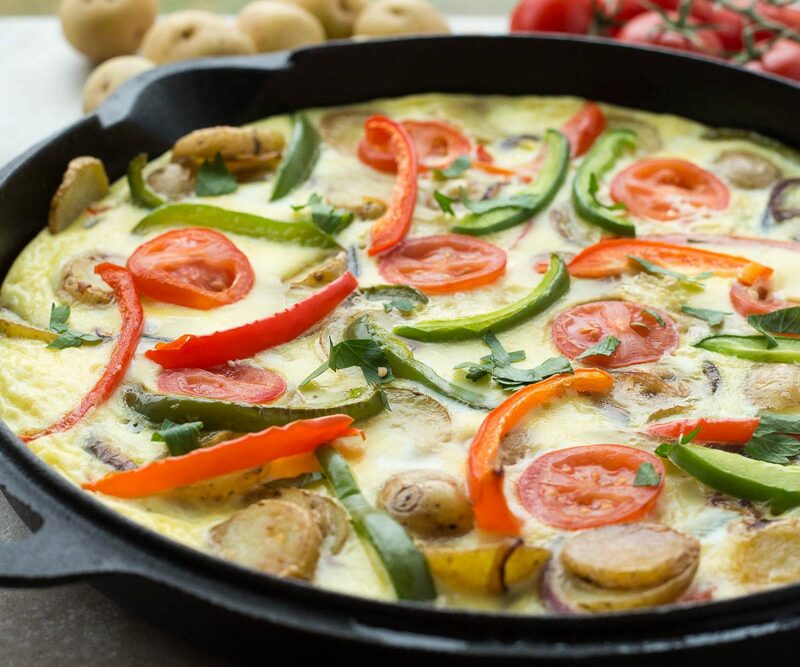 This Spanish Tortilla is really just a Spanish omelette — made with sliced potatoes, onions and peppers fried together before being topped with beaten eggs and baked. It’s perfect festive holiday breakfast! In a large oven safe skillet (I used a 12-inch cast iron skillet), heat canola oil over medium-high heat. Add potatoes and cook, stirring occasionally, for 6 to 7 minutes. Add onion and peppers and cook another 5 to 6 minutes or until potatoes are crisp-tender (they won’t cook much more in the oven). Meanwhile, stir together eggs, milk and salt with a whisk. Pour over cooked potatoes and vegetables. Smooth out potatoes and vegetables with a spatula and top with thinly sliced tomatoes. Bake for 12 to 15 minutes or until eggs are completely set in the center. Garnish with parsley if desired. Great warm or room temperature!